A Bluetooth receiver is a handy device that can let you bring Bluetooth wireless technology to audio devices. Many brands are now entering the Bluetooth receiver market including Elecom and SONY. However, there are many who are still unfamiliar with the AAC, aptX, SBC, and LDAC codecs that affect sound quality. People who are unfamiliar with these codec standards find it difficult to choose for the right Bluetooth receiver. In this page, we’re going to introduce and explain the different aspects of Bluetooth receivers. We’re also going to introduce our top recommended Bluetooth receivers in a ranking format. You can use the device to bring wireless technology to older car media players. Let’s make your music life comfortable by reading on through the rest of this page. 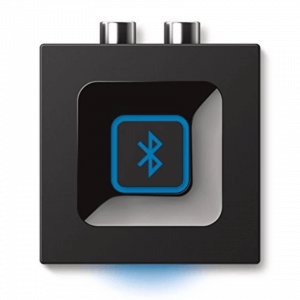 You might ask yourself, “What are the points to consider when choosing a Bluetooth receiver?” We’re here to help you in that regard. The codec is one of the deciding factors that effects sound quality when using audio devices via Bluetooth connection. 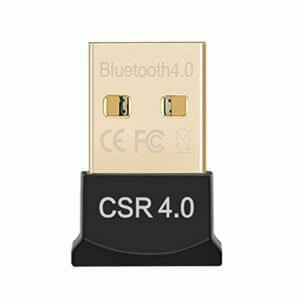 Let’s check out the four codec standards to help you choose the right Bluetooth receiver. SBC or SubBand Codec is the traditional codec standard for many Bluetooth devices. The main advantage of using this audio codec is its high compatibility with a very broad range of gadgets on the market. However, keep in mind that the sound quality it offers isn’t high. Audio compression is very apparent when making use of SBC. In other words, sound quality decreases as the audio passes through the wireless network. If you hear someone say, “The wireless audio sounds bad,” it’s probably because the Bluetooth receiver uses SBC. There are also other challenges when using Bluetooth receivers that use the SBC standard. For instance, you might experience lags in audio or the disappearance of the high-frequency range. Some static noises might also be generated from the use of this codec. SBC is still a great choice for some music lovers, especially if you don’t mind the sound quality and just want to listen to your favorite tracks. However, if you want to enjoy high-quality audio, then we recommend using another codec type. AAC or Advanced Audio Coding is the standard codec mainly used in iOS devices, specific for iPhone users. The AAC solves many of the issues with SBC. Still, the compression quality is still roughly the same as SBC. Nonetheless, there’s an increase in the amount of allowable transmitted data. As a result, any audio lags are either improved or resolved. Also, it’s now possible to enjoy music at a quality higher than SBC because of its high-frequency range. If you have an iOS device, then choosing the AAC standard might be your preferred codec type. The aptX codec further improves the audio quality offered by AAC. Its main highlight is its compression ratio because it’s even smaller in comparison to SBC. There’s a reduction in the range of the crash, and any lags in any audio or music-playing performance are either solved or significantly reduced. Playing movies with the support of the aptX codec will let you enjoy any visual and audible feature to be in sync. Another variation of aptX is aptX low latency, and it’s a codec made for audio and video synchronization for different video and gaming applications. aptX low latency offers a slightly better experience than the standard aptX codec, but the transmission requires a short distance between devices. Bluetooth technology now ranges from version 1.1 to 5.0 with the latter being the latest communication standard. Reports show that the latest versions now carry support for longer wireless ranges. Other benefits to using an up-to-date version of Bluetooth include better sound quality and better efficiency for power usage. However, since Bluetooth 5.0 is fairly new to the scene, there are still many devices that still don’t support this new technology. As such, you still have to consider the compatibility of your wireless headphone or earphone with the Bluetooth receiver. 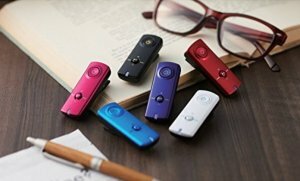 If a Bluetooth receiver is compatible with your devices and can be used in a fully long distance for your daily life, it would be the best product for you. The ideal battery life for a Bluetooth receiver is about 7 hours. However, the battery life may extend or decrease depending on how you use the device. For example, if you only use the receiver during commutes to school or work, then it’s possible to extend the battery life of the device because you’re not going to put too much pressure on it. On the other hand, if you’re going to use the Bluetooth receiver for continuous play, then the stress of playing music or media for long hours might damage the internal battery over time. Also, It can be lead to battery deterioration if you keep the device plugged into an electrical socket even though the battery is already at full capacity. Thus, it’s great to have a Bluetooth receiver with a battery which lasts 1 or 2 hours longer battery than your actual need. Are you going to use the Bluetooth receiver at home or on-the-go? If you’re going to use the wireless receiver on-the-go, then a short distance should suffice since you’ll be keeping all of your gadgets close by. On the other hand, if you’re going to use the Bluetooth receiver in an indoor environment, then you might want to use a unit that offers long distances for wireless communications. In doing so, you are free to move about the room without much worry of lags or disconnections from your wireless connection. The most common Bluetooth communication distance you’ll see on wireless audio receivers is 10 meters. There are also some Bluetooth receivers on the market that’ll allow a wireless communication of up to 100 meters. Choose a receiver that has a reasonable amount of communication distance depending on your personal requirements. The ideal weight for a compact Bluetooth receiver is 0.2 to 0.5 pounds, especially if you’re going to use the device for everyday carry. Choosing a lightweight receiver won’t put an additional load on your bag or pocket. 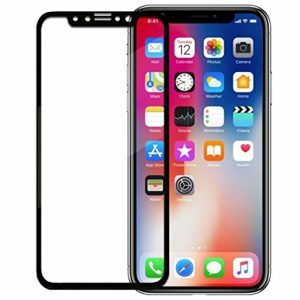 Aside from the weight of the receiver, you should also consider the size of the device. Bluetooth receivers tend to have a compact design. Still, it can be a great choice to consider buying and using a device that you can easily put in your pocket or purse. In this segment, we’re going to introduce our top recommended Bluetooth receivers in a ranking format. Do consider our list whenever you’re out on the market looking for a device to help you wirelessly listen to different media. 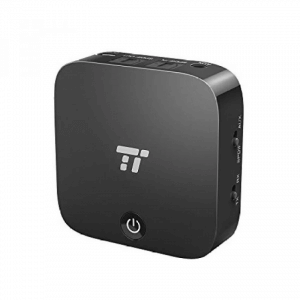 This Bluetooth transmitter and receiver has multiple connectivity options like Bluetooth and AUX In and Out, and you can connect multiple devices at the same time unlike its more portable counterparts on the market. It also makes use of the aptX low latency codec for high-resolution audio streaming. This product can be a suitable choice for home entertainment systems to properly communicate with each other through either wired or wireless means. Enjoy wireless audio streaming for your game consoles like the Nintendo Switch with this device that supports aptX low latency codecs, which enables smooth play of your games without sound delay. Despite reports claiming that it’s difficult to pair two devices together with this product, the high-resolution audio makes up for the complex setup process. If you have a game console and wireless earphones/headphones, then this product might be a good choice for your gaming needs. 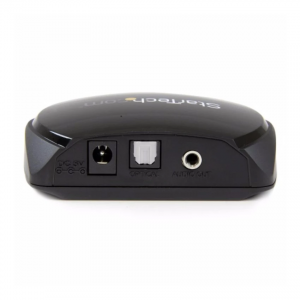 This Bluetooth receiver is great for indoor use as it can receive wireless signals from up to 15 meters. 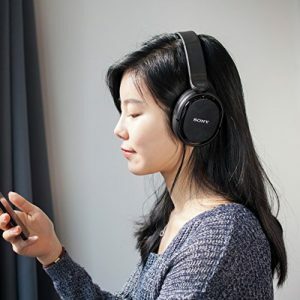 It does have a bulky design which might disappoint some looking for a portable unit, but it’s a good choice for anyone who wants to enjoy wireless audio streaming inside their homes or offices. It’s also chock-full of features like a multipoint Bluetooth connectivity (for simultaneous wireless connections) and it’ll even remember every device paired to it. This device’s main advantage is its great compatibility with the use of SBC, but that’s also its greatest downfall. Since compatibility is prioritized above most of its features, the audio quality suffers quite a bit. 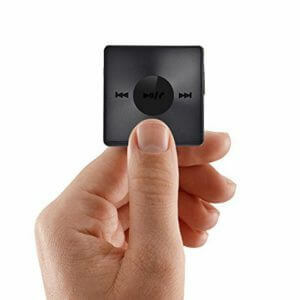 This device is impressively small which makes it a good choice for any music lover who’s always on the go. It even comes with a 15-hour battery life that doesn’t disappoint. Just make sure your wireless headphones or earphones can keep up. 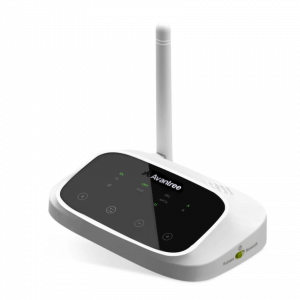 This 2-in-1 Bluetooth transmitter and receiver also makes use of the aptX low latency codec. As a result, you’re always going to get a high-quality listening experience from the wireless connection. If it weren’t for the confusing setup guide, it would be a better product for a larger range of listeners. 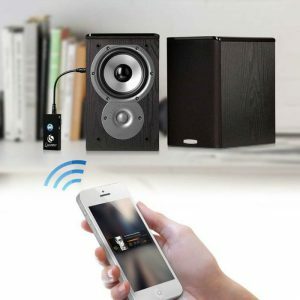 If you have an iPhone or an iPad, you can easily connect to Siri with the help of this Bluetooth receiver. Connect this device to your car’s aux input to enjoy hands-free operations. A press of a button will “wake up” Siri on the connected iOS device. You can even enjoy hands-free calling with the use of this product’s dual microphone setup. One microphone receives the sound from your voice while the other reduces the unwanted noise for clear calls. 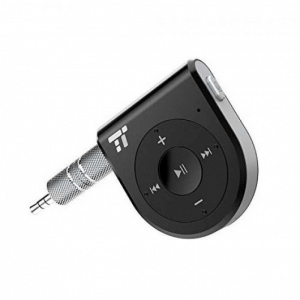 Additionally, this Bluetooth receiver makes use of the AAC audio profile for great compatibility with iOS devices. The use of a fiber coaxial cable that comes with this device allows you to listen up to 3 GHz of audio. As a result, it’s a great choice for devices that require personal radio frequencies for private listening without worry of static responses. With its support for SBC and aptX, you can also connect this receiver to a speaker or media player for high-resolution audio streaming. Its 20-meter wireless receiving range may not be as long as others (like receivers that can accommodate audio from 50-meters away), you can still use its wireless capabilities in a small to medium-sized room. There are other Bluetooth receivers with convoluted pairing instructions, but this model allows you to connect with your mobile gadgets with a press of a button. 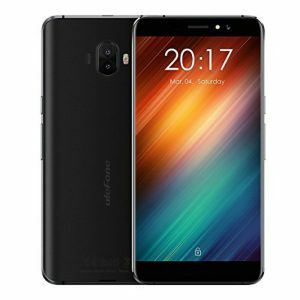 However, it adopts Bluetooth 4.0, which is less efficient in power-saving than Bluetooth 4.1, but it still provides a more-than-reasonable wireless performance. Also, its 10-hour battery life allows you to continuously listen to music for an entire workday. 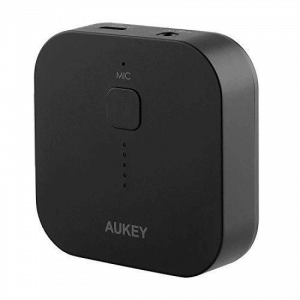 Enjoy all of its features from a Bluetooth receiver with very portable dimensions. 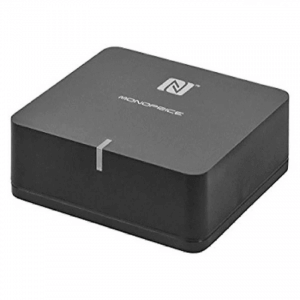 This Bluetooth receiver takes advantage of Near-Field Communication (NFC) to allow other NFC-enabled devices to pair with this product with a simple touch. If you have an NFC compatible device, you can benefit from its easy pairing. You can even simultaneously connect up to 8 devices to this receiver at the same time. 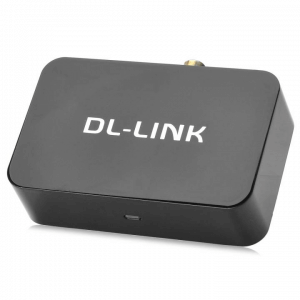 As a result, this device is an ideal choice if you have multiple devices in your home entertainment system you want to wirelessly connect without spending more money for additional receivers. Normally, a Bluetooth receiver has a function called DAC (Digital-to-Analog Converter) to convert digital data into analog data. Since this product uses DAC made by Wolfson, which is one of the most popular manufacturers of DAC, you can enjoy high-quality music. Also, it can receive your music data without degrading sound quality because it supports the AptX codec. It has NFC for quick pairing with other Bluetooth-enabled devices. If you want to enhance your overall wireless audio experience, then this can be an ideal product for you. 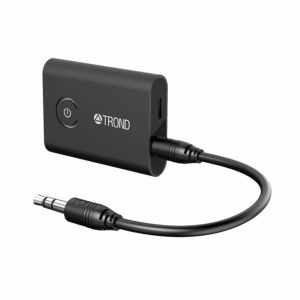 This Bluetooth receiver only weighs about 0.11 pounds, which is great if you want to bring along during a commute or travels. This device also has a built-in microphone for hands-free calling. Now you don’t have to hold your phone near your ear if you’re in a long call. 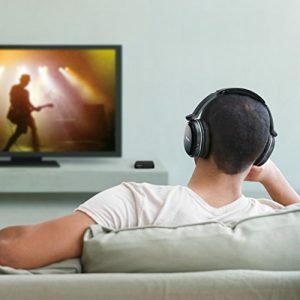 This product supports the AptX Low Latency, so you can enjoy not only high-quality music but also watching movies and playing games without sound delay. If you need a multipurpose Bluetooth receiver, then you might not want to look further than this product. If your wireless audio-listening device isn’t compatible with your home entertainment system, then you can use a Bluetooth receiver in this regard. It doesn’t mean that a headphone or earphone has Bluetooth that it immediately becomes compatible with a vast array of Bluetooth-enabled devices. You should always consider the compatibility of the wireless devices in the area. 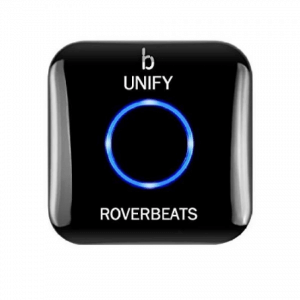 Also, many Bluetooth receivers are compatible for use on car stereos. Hence, older vehicles without Bluetooth-enabled stereos can take advantage of a Bluetooth receiver for you to wirelessly connect your mobile device. You can also use a Bluetooth receiver when you want to watch movies late at night without waking up the entire household. Using the right Bluetooth receiver allows you to listen in peace without worry of disturbing other people in the immediate area. Now that you’ve reached the end of this post, what did you think about our guide and list? Even if some audio equipment might not be compatible with each other, you can take advantage of the right Bluetooth receiver to help fix the issue. Buying a Bluetooth receiver tends to be cheaper than buying a new media player or a new pair of headphones.